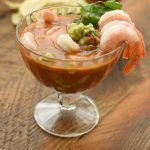 Mexican Style Shrimp Cocktail is so easy to make at home and we love that you can really customize it to how spicy you like. 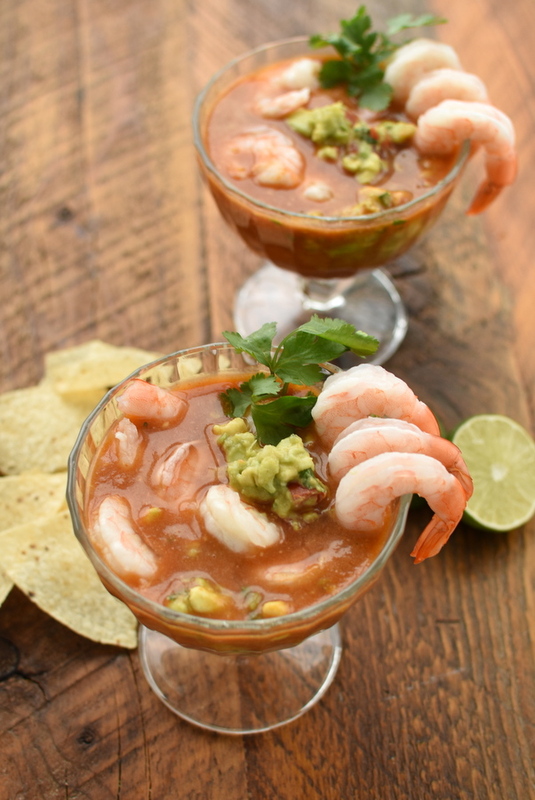 What does Mexican Shrimp cocktail taste like? 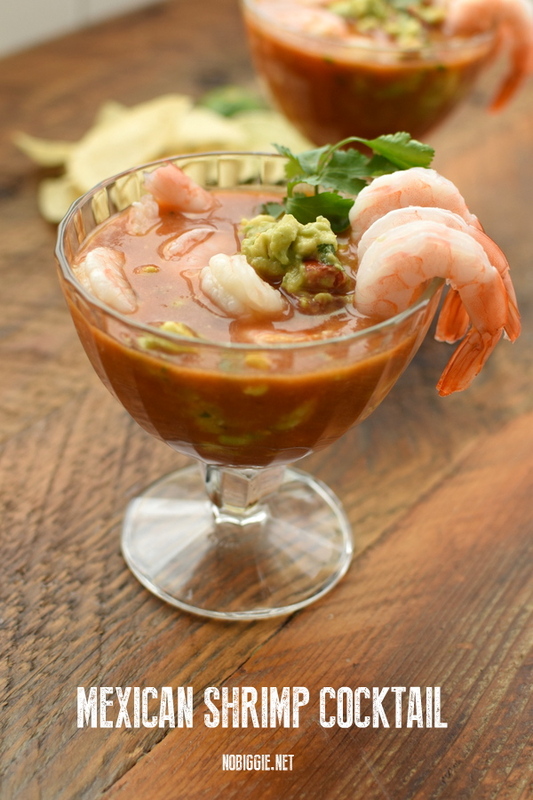 Mexican Style Shrimp Cocktail is like shrimp cocktail mixed with a spicy gazpacho and it’s delicious! It’s fun to order when eating out, and it’s fun to make! You can make it more or less spicy depending on your preference. Bring 1 cup of salted water to a boil. Add the uncooked shrimp. Stir and cook until the shrimp turn pink…about 2 minutes. Remove the shrimp from the water and set aside. Place chopped tomatoes, cucumbers, red onion, and jalapeños is a mixing bowl. Add ketchup, spicy V-8, lime juice, cilantro, and hot sauce. Gently mix until ingredients are well blended. Chop the shrimp into bite-size pieces, leaving a few whole (with the tails on) for a garnish. Stir chopped shrimp into the tomato mixture. Cover with plastic wrap. Place reserved whole shrimp in a separate bowl and cover with plastic wrap. Refrigerate shrimp cocktail and reserved shrimp until chilled about 1 to 2 hours. If mixture seems a bit thick, add a little more tomato juice or pickle juice. When ready to serve stir in the avocado chunks. Serve in clear glass bowls. Top with reserved whole shrimp and more chopped cilantro leaves. 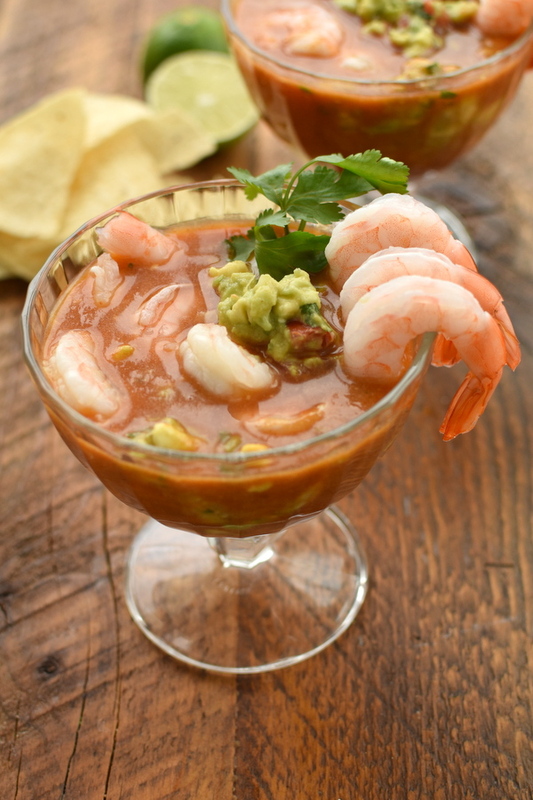 Mexican Shrimp Cocktail made with big shrimp avocado and spicy V8 is one of our favorite Mexican appetizers. Place chopped tomatoes, cucumbers, red onion, and jalapeños is a mixing bowl. Add ketchup, spicy V-8, lime juice, cilantro, and hot sauce (if desired). Gently mix until ingredients are well blended. 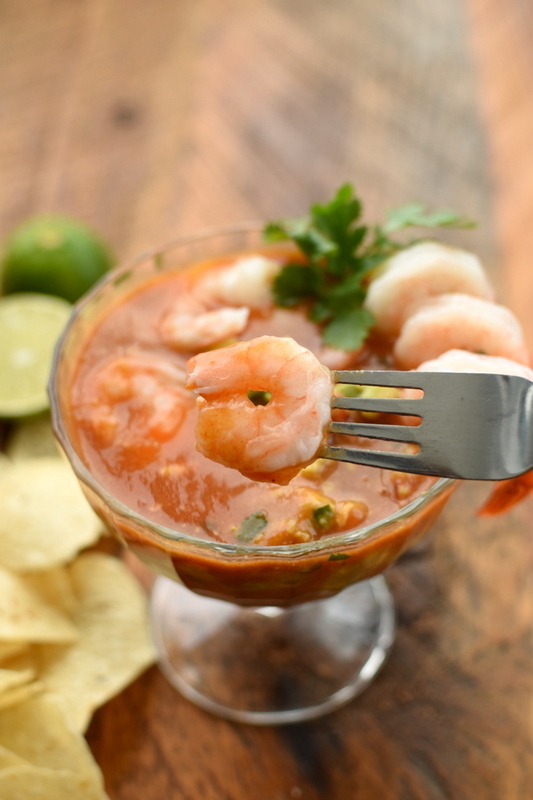 Chop the shrimp into bite-size pieces, leaving a few whole (with the tails on) for a garnish around the rim. Stir chopped shrimp into the tomato mixture. Cover with plastic wrap. Place reserved whole shrimp in a separate bowl and cover with plastic wrap. Refrigerate shrimp cocktail and reserved shrimp until chilled (about 1 to 2 hours).